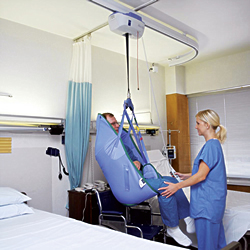 Maxi Sky 600 is a ceiling lift system that enables patients and residents to be transferred in a comfortable and dignified way. For the caregiver, it offers an easy-to-operate system that eliminates manual lifting. Maxi Sky 600 price does not include track/installation components/slings/installation. A single caregiver can perform transfers quickly and efficiently, controlling all procedures with the handset. Maxi Sky 600 saves time, because it is always available for use and is within easy reach for the caregiver. When it’s not in use, the unit takes up no precious floor space as it is discreetly out of sight at the recharging station on the overhead track. What makes Maxi Sky 600 unique? It is a total concept. ArjoHuntleigh does much more than deliver an advanced ceiling lift; we offer complete support every step of the way from track design to long-term system servicing. Automatically and continuously charges the Maxi Sky 600 batteries, allowing the caregiver more quality time with the patient, while ensuring a safe and comfortable transfer. We will help you create a layout that provides ideal coverage using our revolutionary modular track. Track installation is a quicker and easier process due to a new patented bracket design. The tight radius of the curved track sections enables layouts with superior space utilization. Track sections fit together using a unique pin-locking system, and once in place, the seamless joints provide a smooth ride for the client during lateral movement. The lift is always ready for use. After transfers, the lift can be programmed to return to the clip-on charging station, which can be positioned anywhere on the track. Regulation of lateral speed and spreader bar height is programmable from the handset. Electronic soft-start/ soft-stop enables the lift to be stopped smoothly and safely in the required position. Battery changing is easy and requires only a screwdriver. A red light on the lift alerts the caregiver when servicing is required. Access to our patient interface solutions – clip slings, loop slings, spreader bars and stretcher frames – gives you unrivalled flexibility to adapt to different needs. We not only provide thorough guidance on how to use the system correctly, but also offer training on ergonomic working techniques. ArjoHuntleigh’s technical support staff ensure that regular servicing and any unforeseen problems are dealt with quickly and efficiently. Unit weight (batteries included): 28 lbs. Lifting speed: 1.2"/sec. at 600 lbs., 1.6"/sec. at 440 lbs., 2.3"/sec. at 0 lbs.